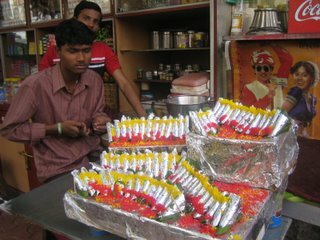 Paanwalas selling their special custom made paan masalas wrapped in betel leaf, which they call tambula. A mobile paanwala at Sasoon Docks, Mumbai, 3AM. The betel nut is one of the many ingredients found wrapped in the paan leaf. It comes from the Areca catechu palm and is not related to the betel leaf, it is only called betel nut because it is often found wrapped in the betel leaf, it is also called the areca nut. Areca nuts are sold in Indian markets either whole, which look like whole nutmeg, sliced into thin discs, or sliced into thin strips. Rose jam, coconut, cardamom, sometimes tobacco, chuna (lime stone paste), katha (an extract made from boiling the bark of the catechu tree), clove, anise, fennel, sof (anise candy), mini candied fruit, tiny candied cherries, are all ingredients that can be found in the paanwalas' masala. 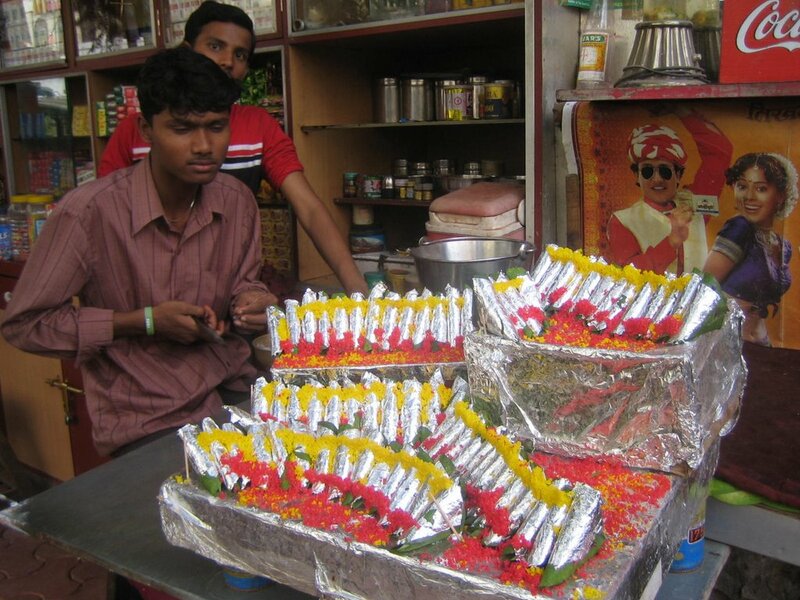 The paan masala is folded into neat shapes like pyramids or cylinders and often adorned with silver leaf and festive colorful garnishes. When chewed, the katha, dyes the entire mouth a bright red color, and creates a blood colored spit. 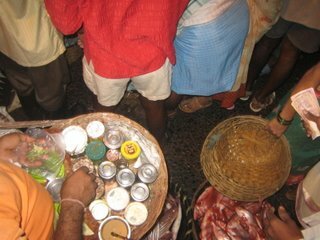 Many paan chewers have permanently stained red teeth and the streets of all Indian towns have red paan stains on that polka-dot the ground. Areca nut is a mild stimulant. 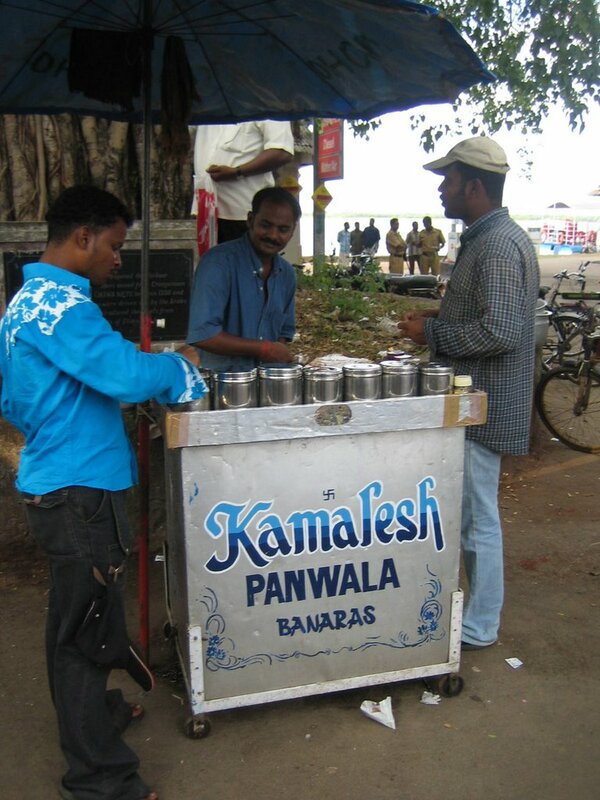 In India most of the paanwalas have long curly mustaches and extravagant cases for all of the paan ingredients. In Taiwan the paanwalas are mostly half naked hoochie mamas called betel nut beauties. In the SF Bay area, paan leaves can be found occasionally at Berkeley Bowl and most of the paan masala fixins can be found at Viks in Berkeley. Tune: Maha Shakti by Debashish Bhattacharya from his Calcutta Slide Guitar 3 album. I picked up this gem of a CD at Aquarius Records on Valencia St. in San Francisco. Debashish Bhattacharya has created his own Indian version of the hawaiian lap slide guitar. Very beautiful. 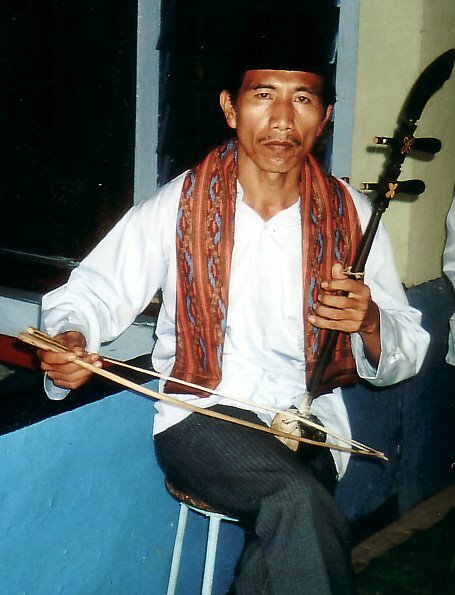 Tune: Kemayoran by Grup Bamba Puang has a beautiful drop tune guitar that is finger-picked while two singers trade off spontaneous verses of outcaste and sorrow. This is another song from the Smithsonian Global Sound team from the Music of Indonesia, Vol. 20: Indonesian Guitars compilation. Tune: Sungguh Terpaksa by La Podding and La Momma has a lively, twangy guitar like sound that seems psychadelic and joyful. This sound comes from a kacopi that La Podding hooked up to an amplifier. The song is a sarcastic comment on modern urban culture in Indonesia comming from a "rural" perspective in the form of a remake of a popular song, according to the folks at Smithsonian Global Sound. 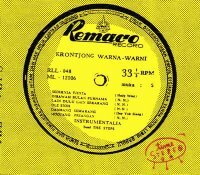 You also can find this song on their amazing Music of Indonesia 20:Indonesian Guitars compilation. Tune: In The Garden by Sonny Treadway on the Sacred Steel album from the Arhoolie record catalog. 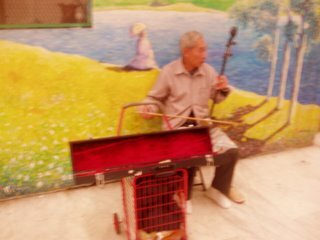 This is Florida Gospel music played on the pedal steel guitar. More pedal steel from some Chicago heavyweights. This is classic PST material. I forgot the name of the song, but I'll never forget how sweet it is when Gary P sings the second verse of this space cowboy anthem. It's like a real guy with real soul. They are on to bigger and better things today as they have metamorphasized into Hummingbiird. But this is a great example of soulful pedal steel guitar. Check out how it falls into space after a few verses and the guitars are set free from the song that holds them back. It's like the transition from the conventional song of PST to the free song of Hummingbiird. Danny S and Gary P tore it up back then, imagine what "space is the place" shinnanigans they are up to today.... or better yet, check out what they are doing today at Cardboard Sangria Records And get hip to The Singleman Affair before he blows up internationally. You don't know? ...now ya know. Tune: Kareta Malam by Elvy Sukaesih from The Rough Guide to the Music of Indonesia is a rolling pop jam that has the playfulness of a Bollywood hit. There is a documentary film that will premier in Singapore next week about Gambang Kromong called Dragons Beget Dragons. Hopefully it will make it to other cities around the world. We are still waiting for Slingshot to come out.